This year’s Dine Out brought us back to some restaurants that we’ve been to in the past. Baru Latino was one of them. We checked it out for Dine Out 2010 (when it was held in April to not get in the way of the Winter Games), and six years later we’re intrigued to give it another shot. The Beef Tiradito was like beef carpaccio; instead of the usual vinegar-based sauce that we are used to, it came with a chimichurri sauce. 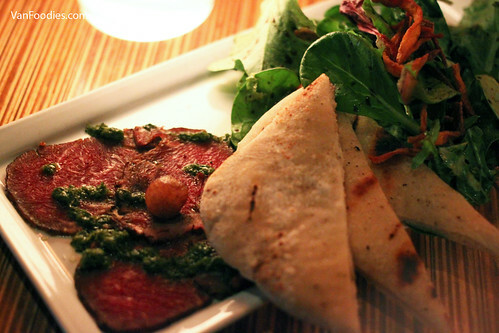 The beef itself didn’t have much flavour, but the chimichurri was seasoned well with herbaceous notes. There was a lot of flatbread to go with just a few pieces of beef slices. Between the two appetizers we ordered, I liked the Baru Ceviche more. There was a decent amount of ceviche, with a good mix of seafood, tomatoes and avocado. It tasted fresh, and creamy, but it could use a bit more acid to brighten it up even more, so make sure to use that lemon wedge on your plate. Mr. opted for the Chicken Mole Stew. We liked that it used chicken thighs and they were moist and juicy, with crispy skin on the outside. There were hints of chocolate in the mole sauce, slightly spiced. 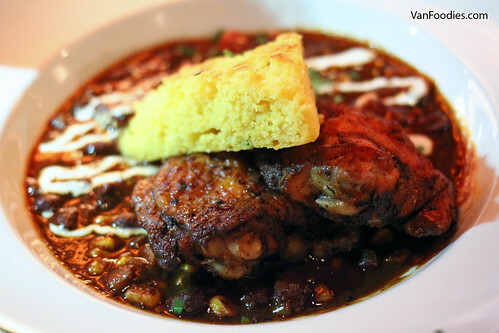 This hearty stew was paired with the jalapeno corn bread, and it was quite moist. There was a long list of ingredients in the Baru Paella and I was able to taste them all: chorizo, chicken, mussels, prawns, scallops and halibut. There were also clams and salmon. I really liked the flavour of the broth, lots of tomato and acid, but as a paella this was way too wet. 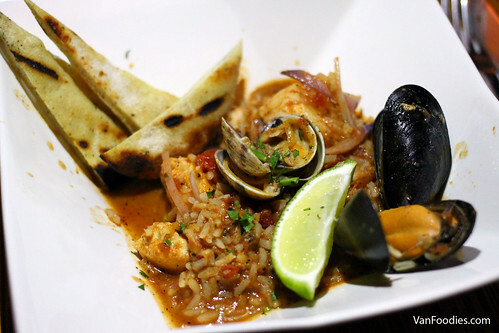 It reminded me more of a cioppino than paella, especially with the addition of flatbread. One of my flatbread pieces was actually burnt on one side, which gave it an unpleasant bitter taste. I would’ve expected that to not make the plate. There was no option for dessert so everyone received a Mango Coconut Panna Cotta. Texture wise, the panna cotta was a bit too runny (not firm enough) for me; flavour wise, it reminded us of the artificially flavoured mango pudding at Chinese restaurants. 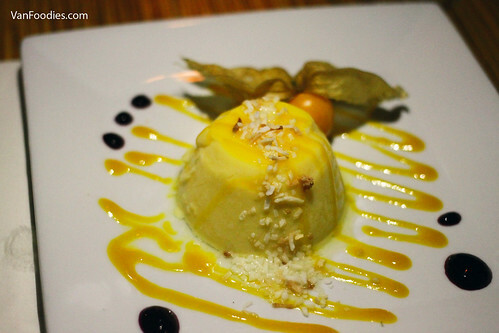 I liked the drizzle of passion fruit and berry sauce on the plate, giving the panna cotta some acidity. There’s some inconsistent in plating — you can see a gooseberry in the picture below, but it was only on Mr.‘s plate. It didn’t make it on my plate, neither was it at the table of four next to us. 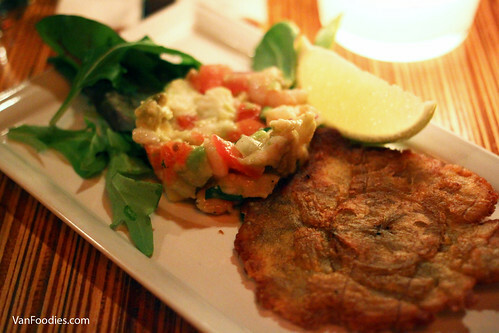 Overall, the dishes were a bit hit and miss at Baru Latino. It was a full house when we were there but a lot of these dishes are on their regular menu so they should have no problem making them in a higher volume. Looking back, our 2010 experience needed some more ooomph in flavours. Six years later, it still hasn’t quite captured our hearts.